Bonjour tout le monde! We are still in Germany and having a great time! However, last week I made a little trip to Paris, to visit my friend and domestic goddess extraordinaire, Clarice. It's only a three hour train ride from our home base in Germany to Paris, so I always try and fit in a visit whenever we are here. This visit was even more exciting than normal because Clarice has just had a baby - the gorgeous Tiago! (Coincidentally, Sandra's sister has also just had a baby, so this Europe trip has been all cute babies all the time). In between catching up with Clarice and gushing over adorable Tiago, we managed to fit in lots of food! I'm really lucky to have (just!) avoided the floods and train strikes. It rained quite a bit on my first day in Paris, but that was just a slight inconvenience, nothing too bad. Stay safe and dry, everybody! As the title of this post suggests, I only had one night in Paris, so I decided to maximise my Paris time by taking the earliest train. The 6:40am train. Eep! 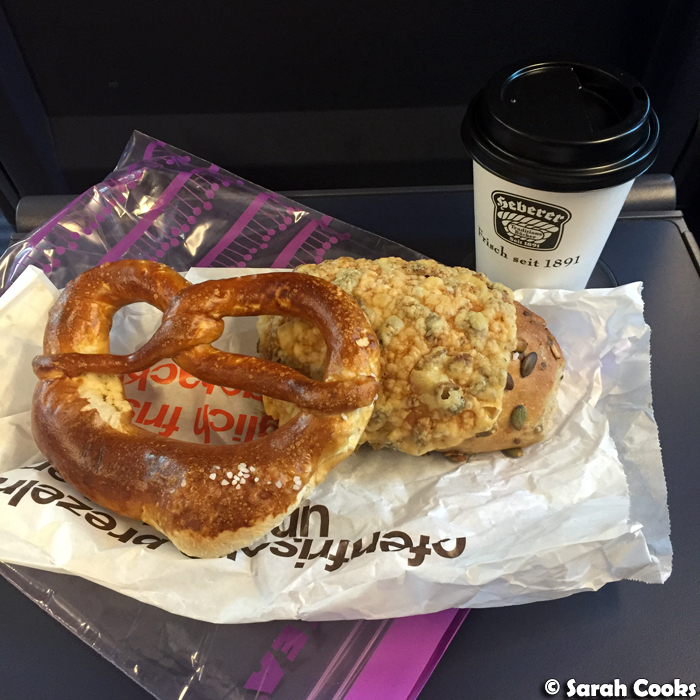 I brought some good German bread and a less-good German coffee with me for breakfast. 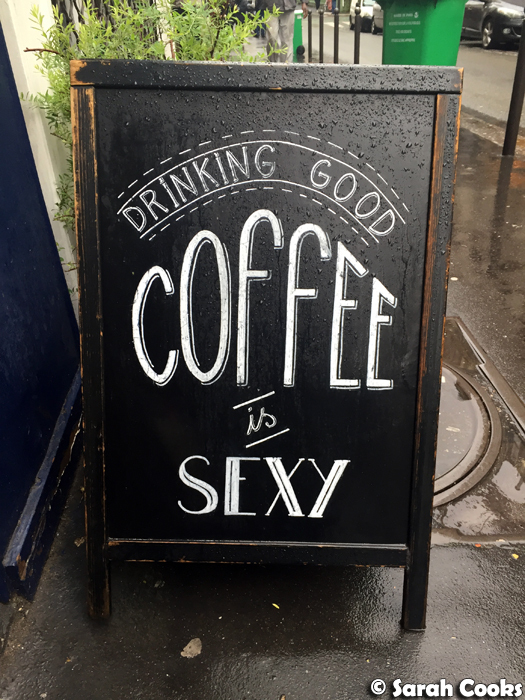 After arriving in Paris, my first stop was for some much needed Aussie-style coffee at 10 Belles (10 Rue de la Grange aux Belles, 75010 Paris). It's a short walk from the Gare de l'Est station, so it made sense! It was super busy, but I managed to squeeze myself into a spot next to the window and really enjoyed my coffee. 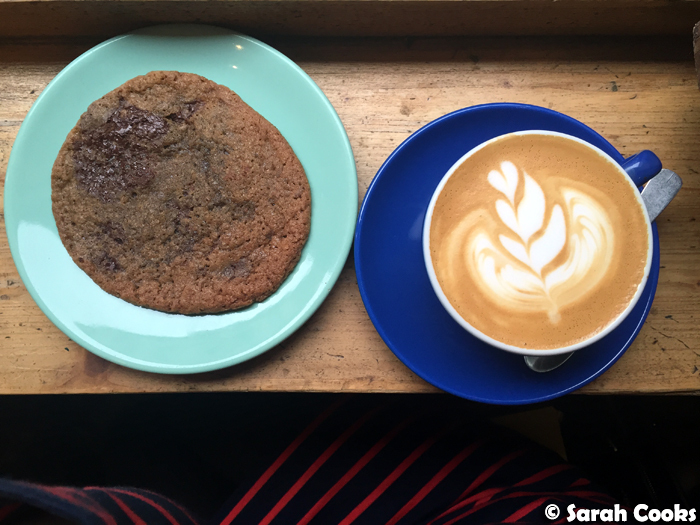 I also got a choc-chip cookie, which was just great - all thin and chewy and buttery, with lots of melty chunks of chocolate inside. Yum. From here, I made my way across town, checked into my Airbnb and headed to Clarice's! 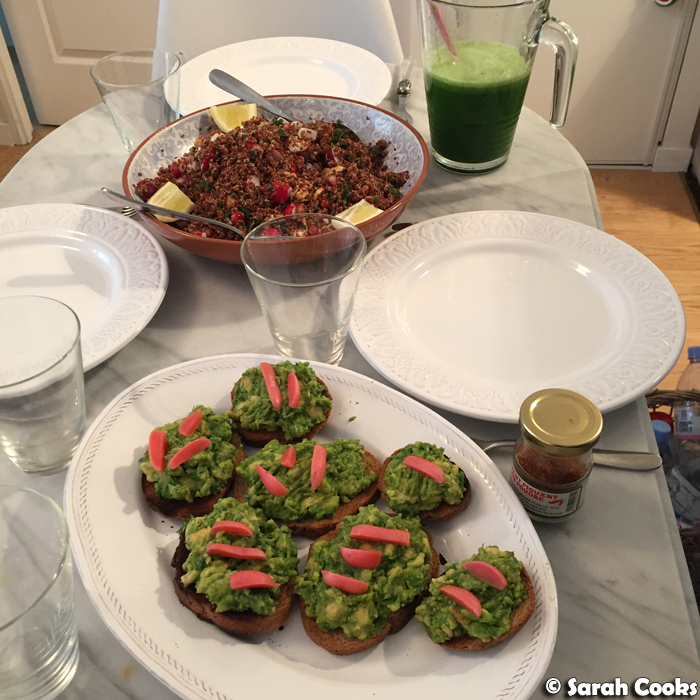 She'd prepared an excellent lunch of quinoa salad (Nigella recipe), avocado on toast with pickled radishes (from Simply Nigella), and some green juice. The lunch was both light and nourishing, perfectly balancing all the hearty meat-and-potato based meals that I'd been eating the previous week in Germany! For dessert, Clarice had baked a loaf of Bill Granger's coconut bread, which you can (just) see in the photo below. She had also made some lime curd to go with - delicious. Mmm... look at all those fresh green vegetables! This makes me want to unearth my parents' old juicer and start making juices at home! For dinner that night, we went to a local Breton crêperie, Tant Qu'il y Aura des Bretons (1 Rue de Billancourt, 92100 Boulogne-Billancourt). 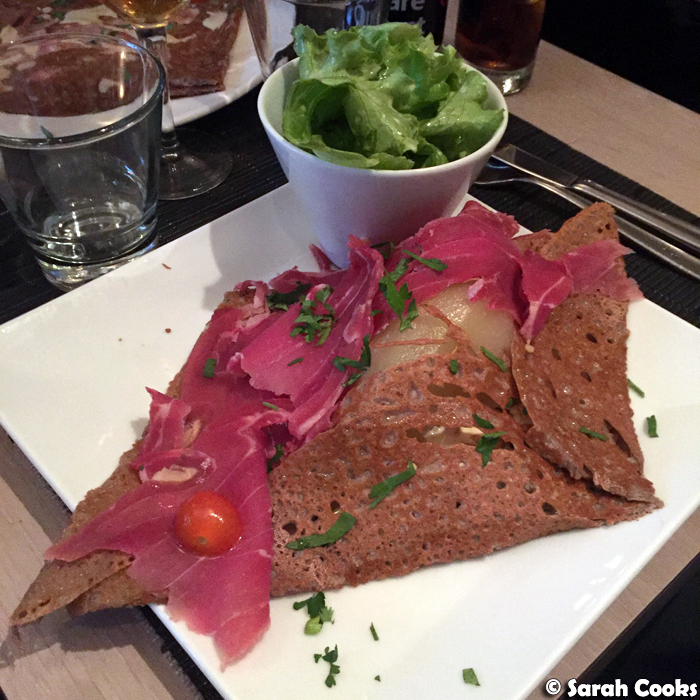 They offer a range of savoury galettes (buckwheat crêpes) and sweet crêpes, featuring ingredients from the Brittany region. They do offer a few modern options, like the "New Delhi", with chicken curry, pineapple, raisins and almonds, but we were all in the mood for something a bit more traditional. 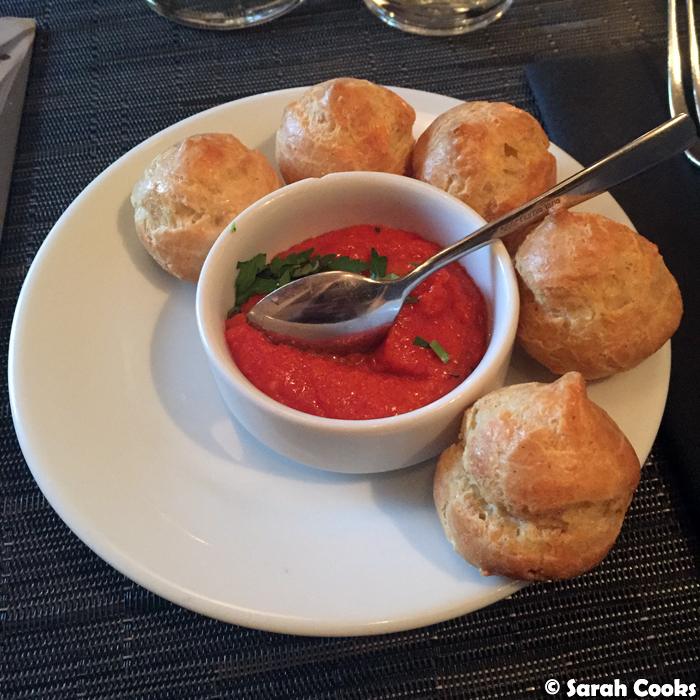 We started off with a complimentary starter of warm choux puffs with red pepper sauce. Lovely! Clarice's crêpe was also impressive, with pears, blue cheese, nuts and generous slices of country ham. 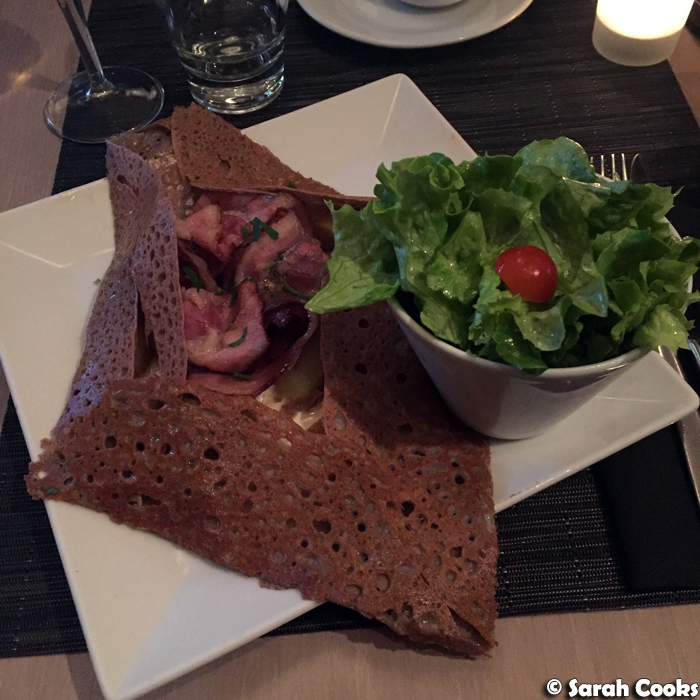 Clarice's partner, José, ordered a crêpe with thin slices of andouille sausage, emmental cheese and mustard sauce. You can see it in the background of the photo below - it wasn't quite as hearty as our meals, but José said it tasted good! 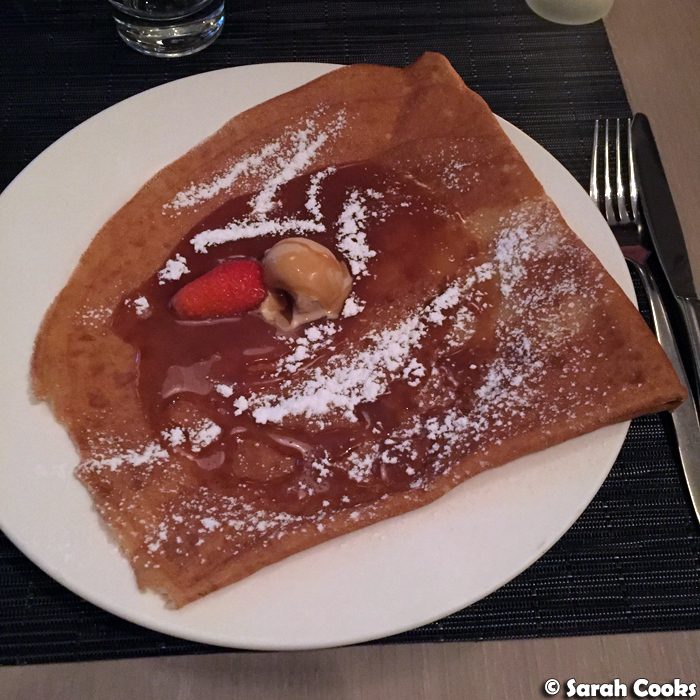 I was getting full, but couldn't resist a dessert crêpe, topped with house-made salted caramel sauce. So good! 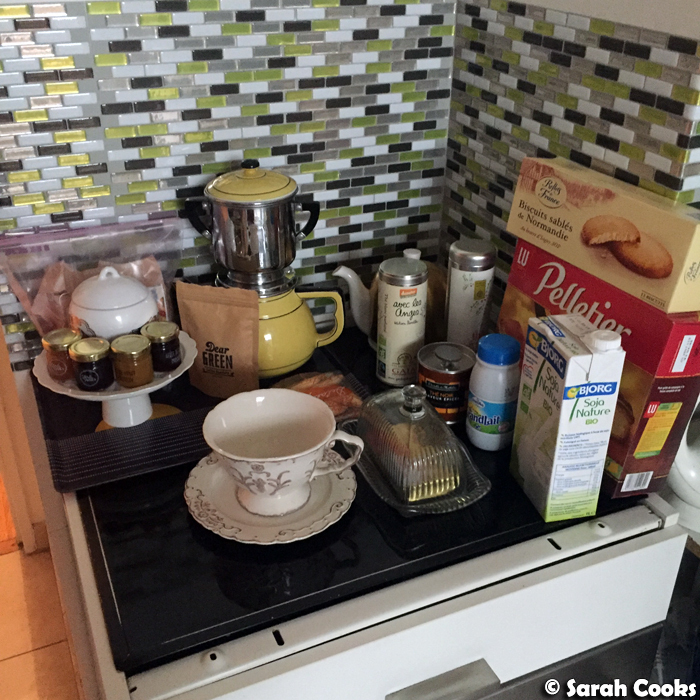 The next morning, I eased myself into the day with a nice cup of tea and breakfast at my Airbnb. I knew I'd have a big day of eating ahead, but the owner had left some nice breakfast supplies and I really wanted to try them! 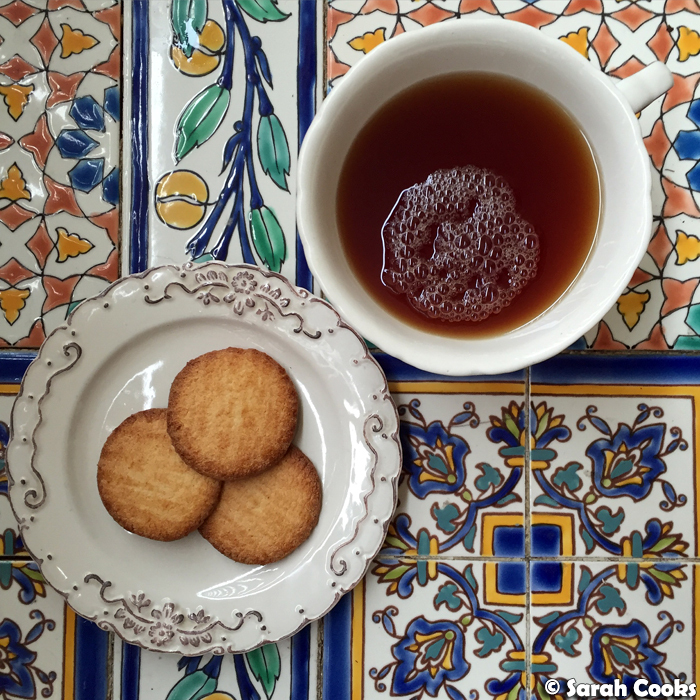 There were crispbreads, butter, jams, coffee and tea, but y'all know that my eyes went straight to the butter biscuits. I love how a butter can have an appellation d'origine protegée. Fabulous. These were delicious, and it was all I could do not to eat the whole packet! 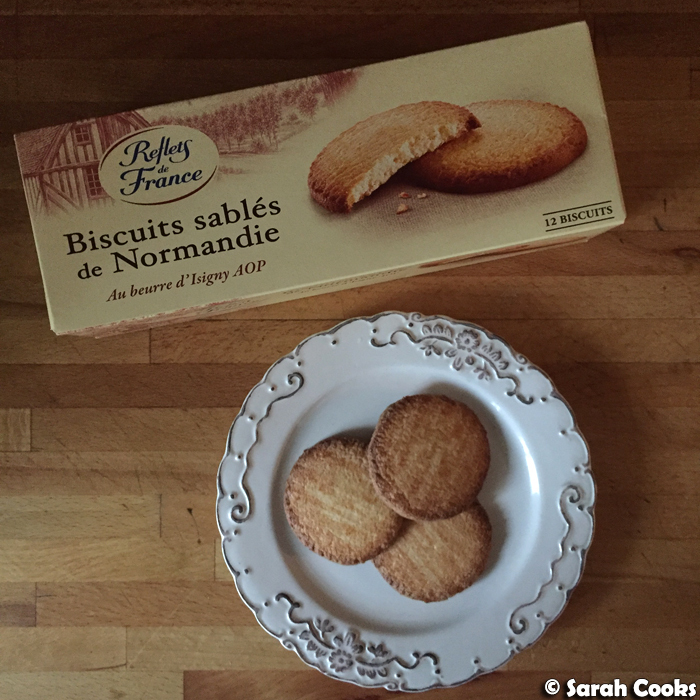 (Reminder to self: splash out on some fancy butter and bake some biscuits sablés at home). When I arrived at Clarice's, she had kindly prepared a lovely breakfast (my second!) 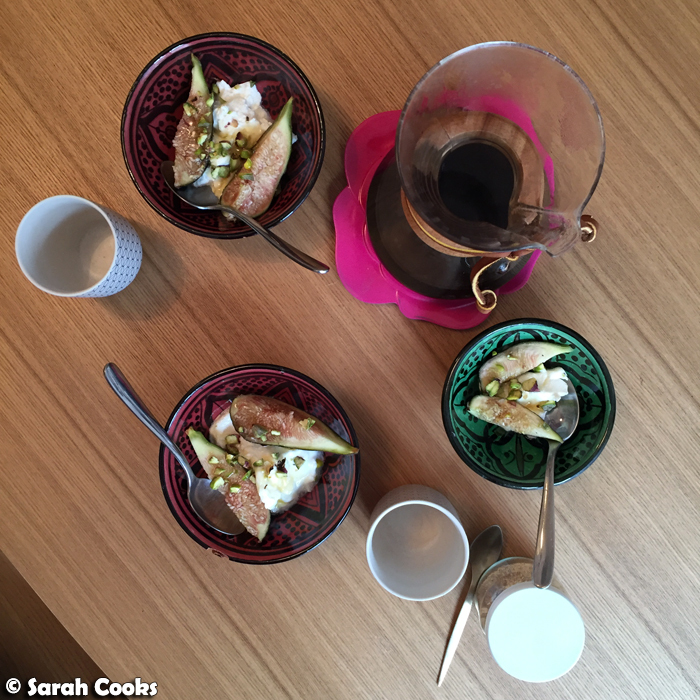 - yogurt with figs, honey and pistachios, and a Chemex coffee. 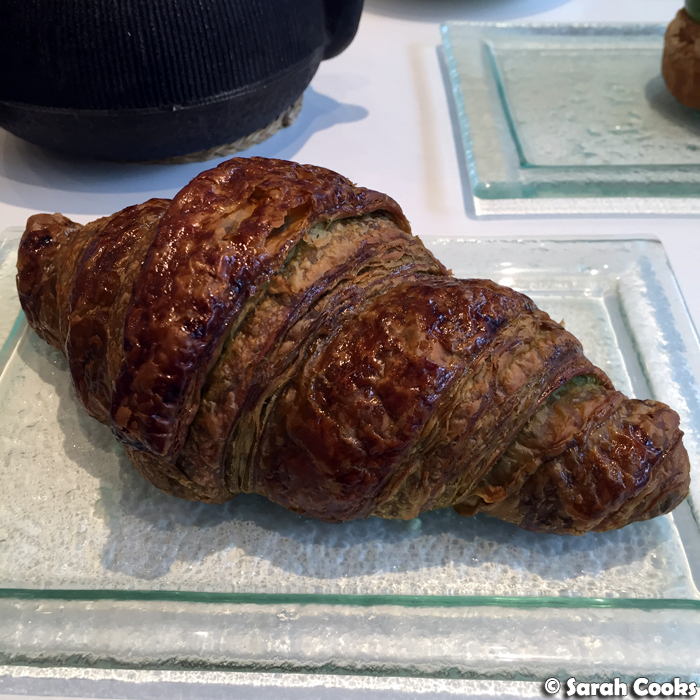 And then we made our way to Sadaharu Aoki (56 Boulevard de Port Royal, 75005 Paris) for a third breakfast. (I'm practically a Hobbit!) 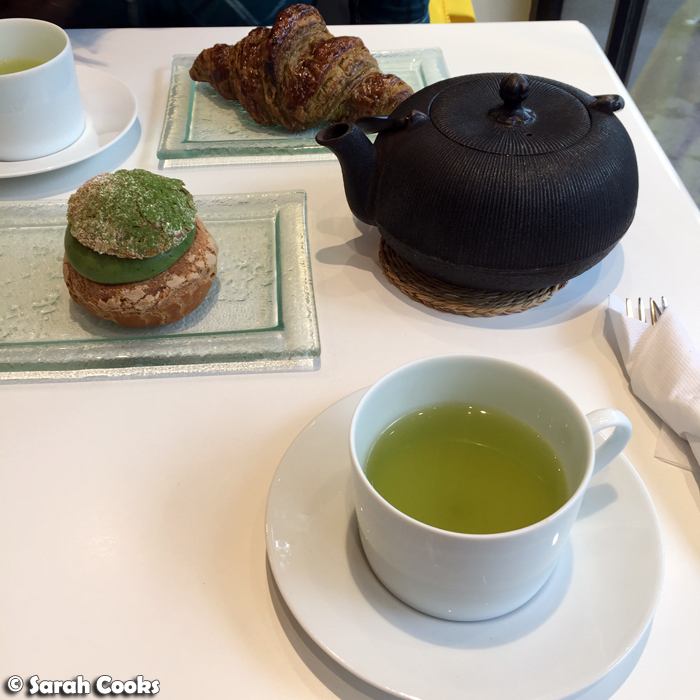 Clarice and I have made a tradition of visiting Sadaharu Aoki each time I visit, and I've noticed that we have a bit of a routine, which I love - a pot of tea each, a matcha croissant each, and a pâtisserie to share. 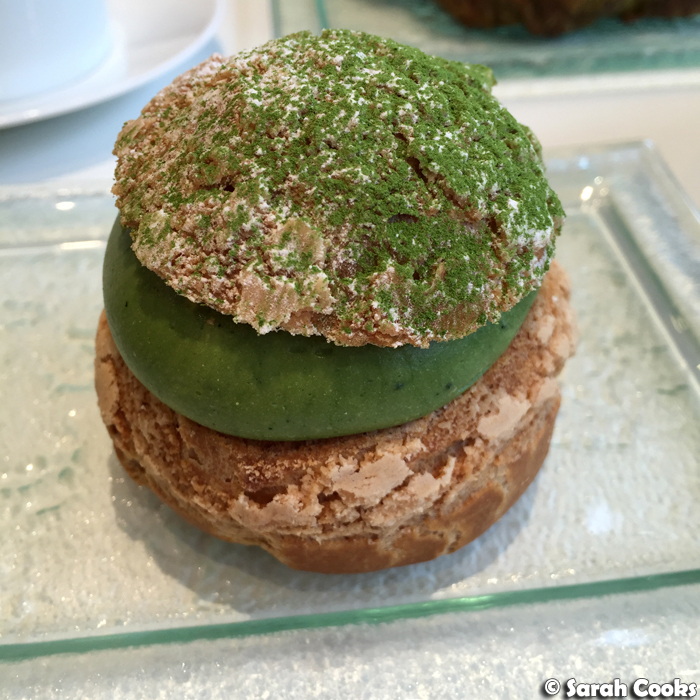 This time, it was a matcha cream puff. 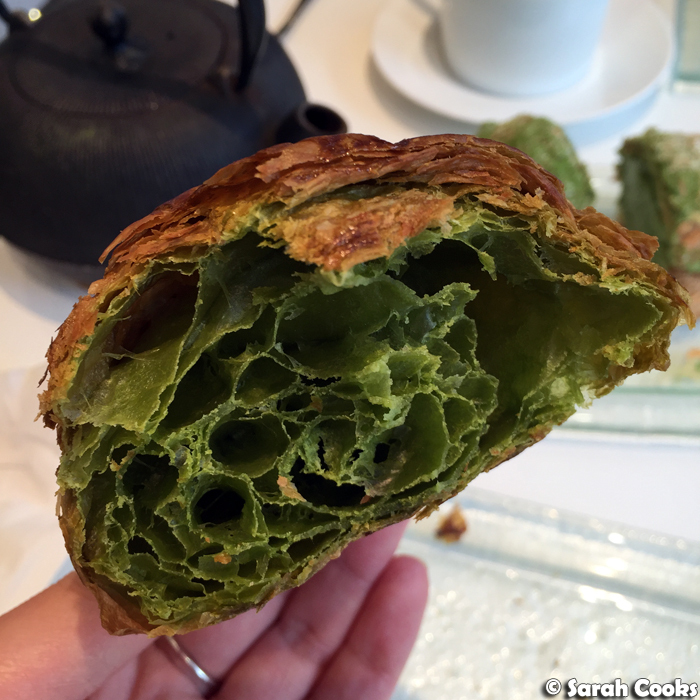 Sadaharu Aoki's matcha croissant is one of my favourite things to eat in the whole wide world! 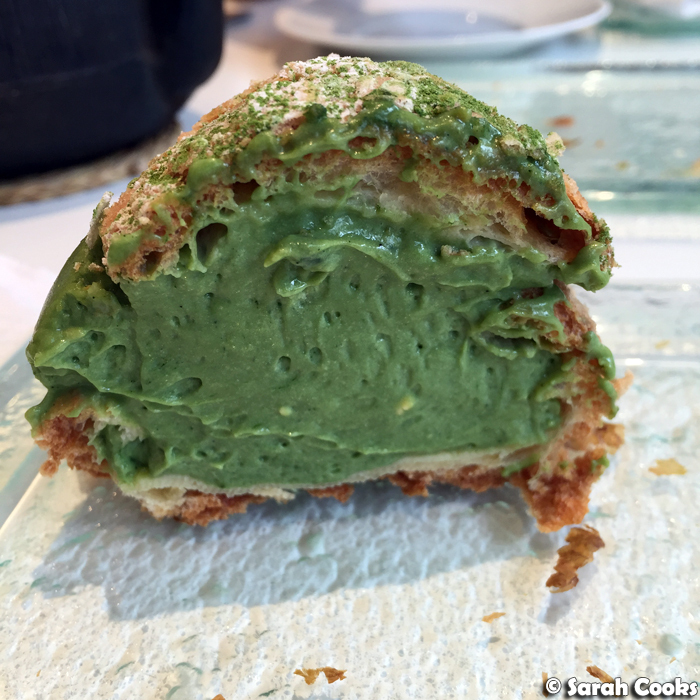 (PS check out my matcha croissant recipe - it's not quite as exquisite as Aoki's masterpiece, but they are tasty and fun to make at home). So much matcha crème pâtissière! From here, Clarice went home to prepare lunch, and I embarked on a little pastry-finding mission! 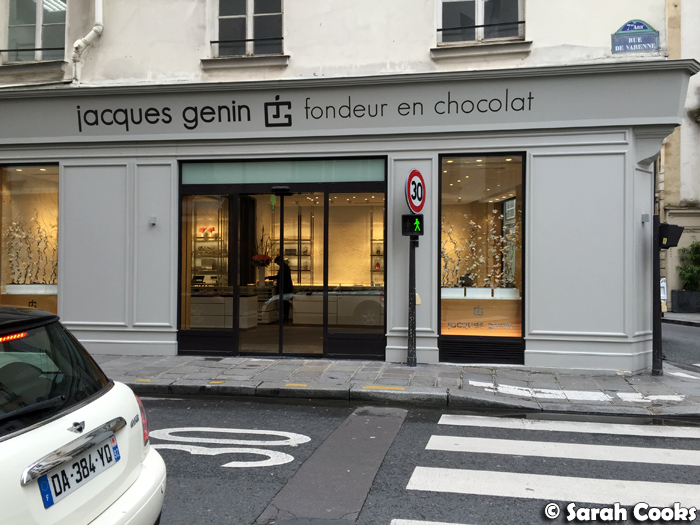 The plan had been to go to the Jacques Genin (27 rue de Varenne, 75007 Paris) in the 7th arrondissement and pick up a Paris Brest for afternoon tea, but when I arrived, I was told that they don't sell pastries on a Wednesday. Noooooooo! I had to "make do" with a box of their famous pralines and some caramels. (You can read about Jacques Genin on David Lebovitz' blog). I didn't have enough time to go across town to the Jacques Genin salon de thé (in the 3rd arrondissement), so Plan B was to go to around the corner to La Grande Epicerie in the Le Bon Marché department store and see if I could find something else for afternoon tea. 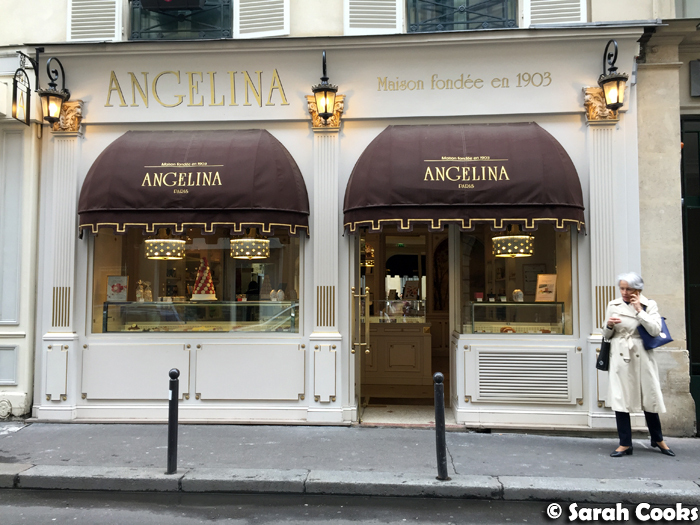 However, walking down the Rue de Bac towards Le Bon Marché, I spotted Angelina (108 Rue de Bac, 75007 Paris)! Woohoo! 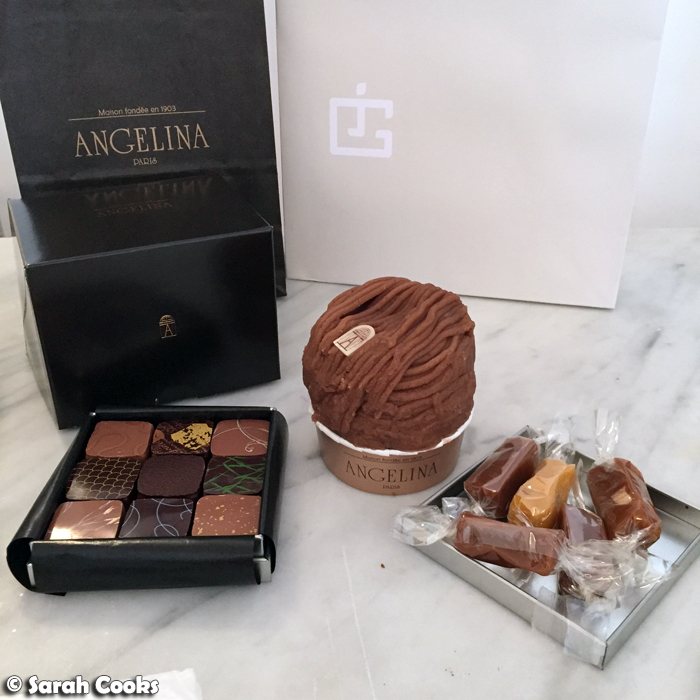 You may remember that on my second-most recent visit to Paris, I'd had hot chocolate at the Angelina salon de thé, and had been meaning to try their iconic Mont Blanc ever since. So I swiftly popped in and picked one up. Incidentally, the Rue de Bac has many nice shops and pâtisseries, as well as the Chapel of Our Lady of the Miraculous Medal, so it's definitely worth a visit. Ok, then it was back to Clarice's for lunch! 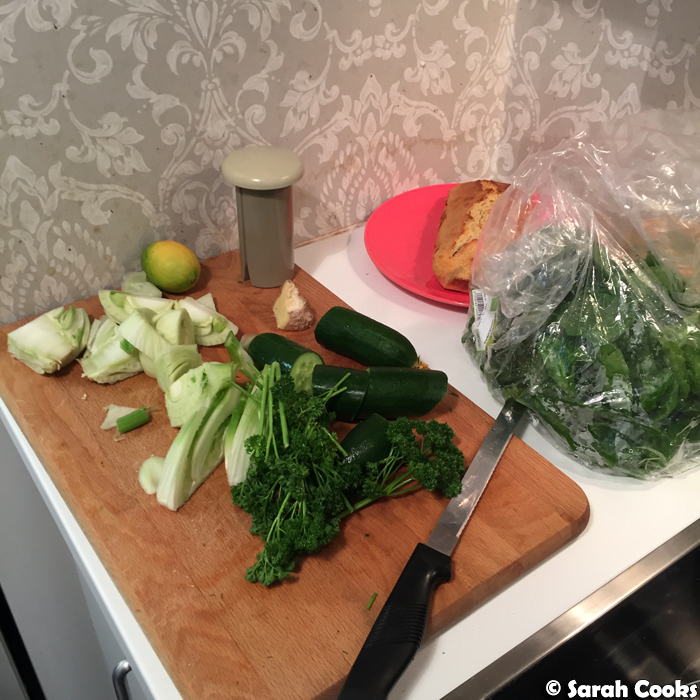 She'd made another delicious and healthy meal of green pea and broccoli soup (recipe from Simply Nigella! 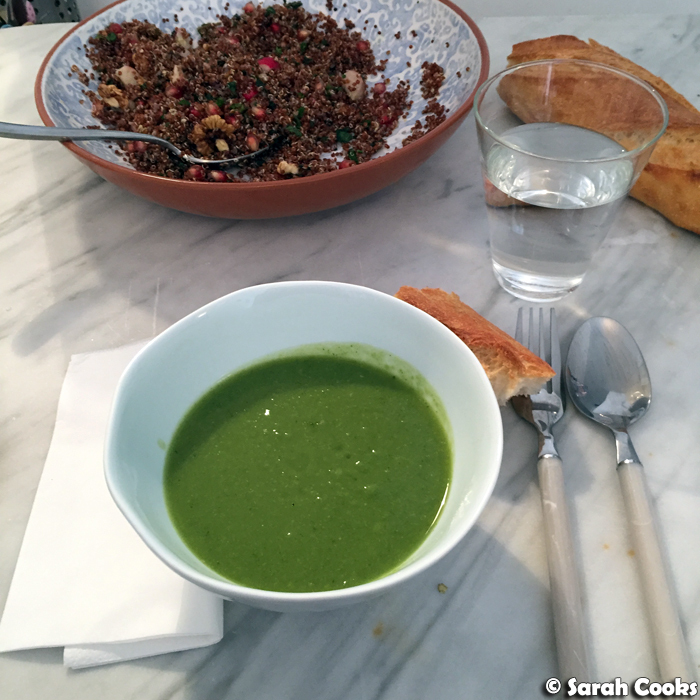 ), with baguette and more of that great quinoa salad. And here is afternoon tea! The chocolates were exquisite (my favourites were the dark chocolate with fresh mint, and the dark chocolate with cacao nibs, as well as the milk chocolate with feuilletine). As for the caramels, I can highly recommend the macadamia ones! I loved the fresh crunch against the silky smooth caramel. And as for that Mont Blanc... wow! Clarice and I shared it, and a silence descended as we ate it. It was just incredible! The base was a crisp meringue, the filling was a super light vanilla whipped cream, and the topping was a really smooth house made chestnut purée. It was so light and the flavours were perfectly balanced. I always thought Mont Blancs were just alright, as others I've tried have been very sweet or with an unpleasantly dense chestnut purée, but this was utter perfection. 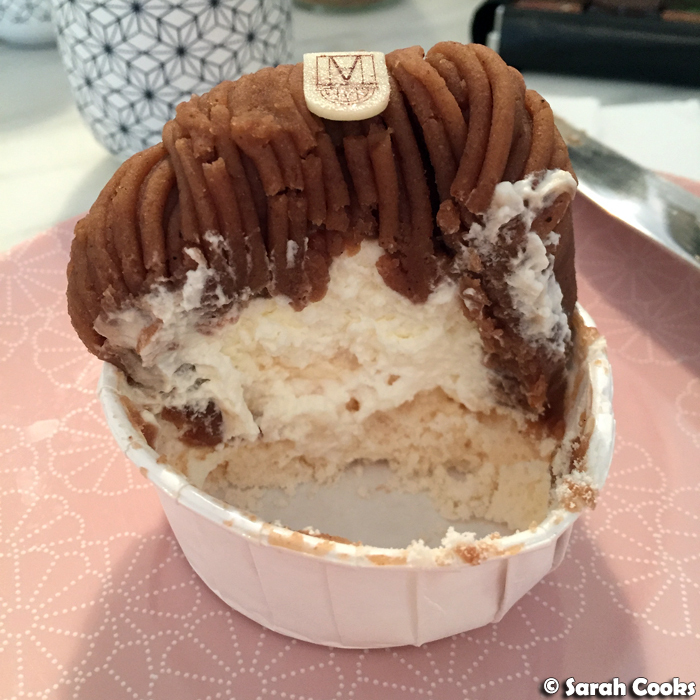 I can definitely understand why Angelina's Mont Blanc is so famous! I am so glad I stumbled across their pâtisserie! Given the limited time in Paris, I planned a sweep of the food hall at Galeries Lafayette (40 Boulevard Haussmann, 75009 Paris) on my way to the station to pick up all my favourites for the train ride back to Germany. It was a good move! 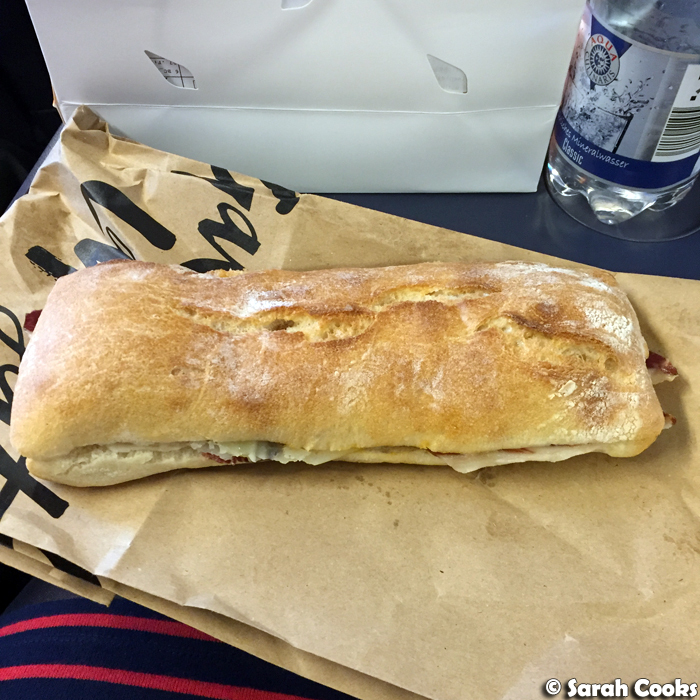 Absolutely non-negotiable on my list was a ciabatta from the Cinco Jotas counter. 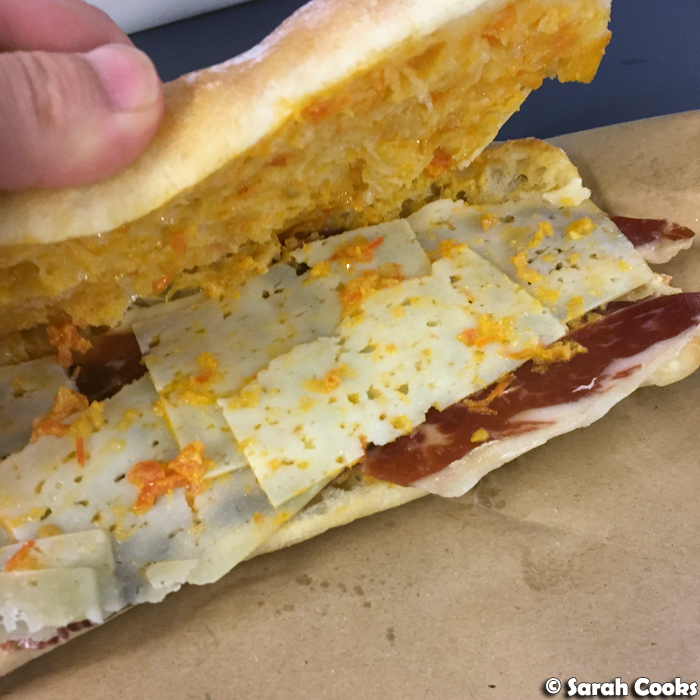 I splashed out on the "Jabugo" sandwich, with pure Bellota jamon iberico, slivers of raw milk manchego cheese and crushed tomatoes with olive oil. This was my dinner on the train. So freaking good! 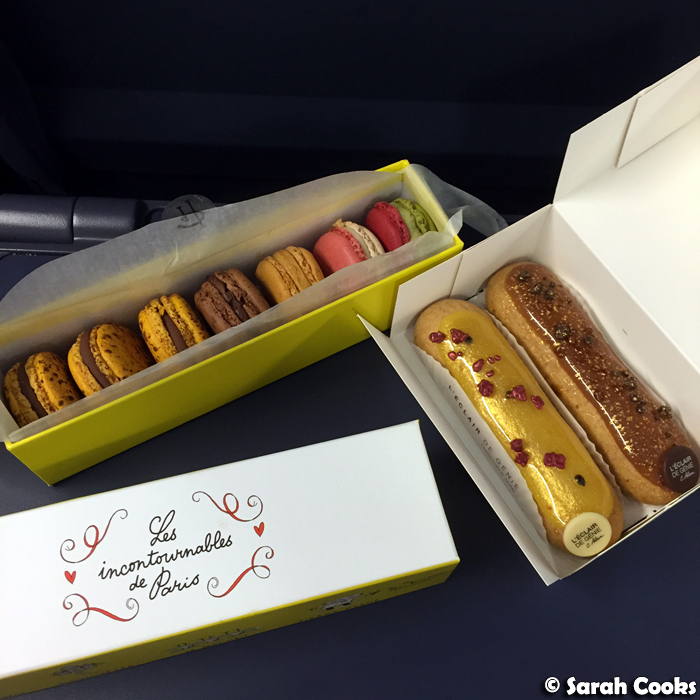 I also got some macarons from Pierre Hermé, and two éclairs from L'Eclair de Génie - I swear, I only ate one eclair on the train! I slowly savoured the rest over the next week. I like how these éclairs have very prominent and pure-tasting flavours, without being overly sweet. On the right we hace the salted butter caramel, which I enjoyed on the train, and on the left we have the passionfruit raspberry (which tasted just as good the next day after a night in the fridge). You can see I got three Mogador macarons (passionfruit and milk chocolate - sublime), as well as an Infiniment Chocolate Paineiras (single origin Brazilian dark chocolate), an Infiniment Caramel (salted butter caramel), an Ispahan (rose, lychee and raspberry), and a limited edition Montebello, with pistachio cream and raspberry compote. All were excellent, and as for the non-Mogador macarons, I was particularly impressed with the Infiniment Chocolate Paineiras. And that was my trip to Paris! It was short but (very) sweet. A big thanks to Clarice for the visit and all the yummy food! If anyone has any foodie recommendations for future visits, please hit me up in the comments! 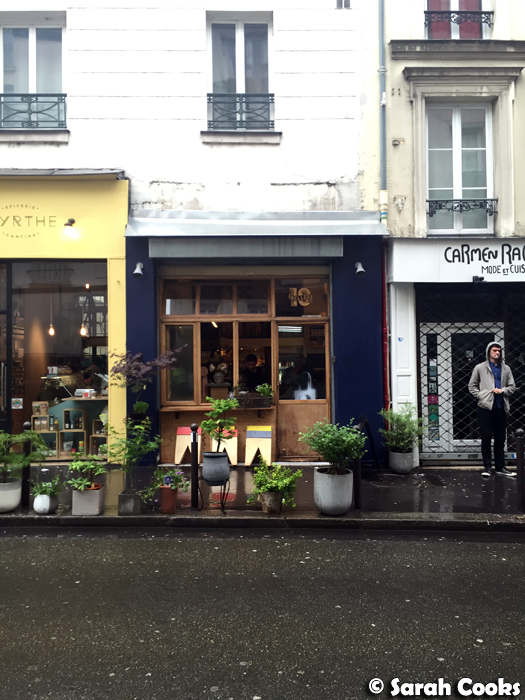 Sounds like a nice day trip :) But surprised you didn't check out the Paris outpost of Hardware Societe! Sounds like you've enjoyed your trip. Isn't Paris a lovely place? And the food are delectable! Totally! I can't believe I ate that much in two days! What a wonderfully delicious quick trip!